This was a happy Havana weekend. 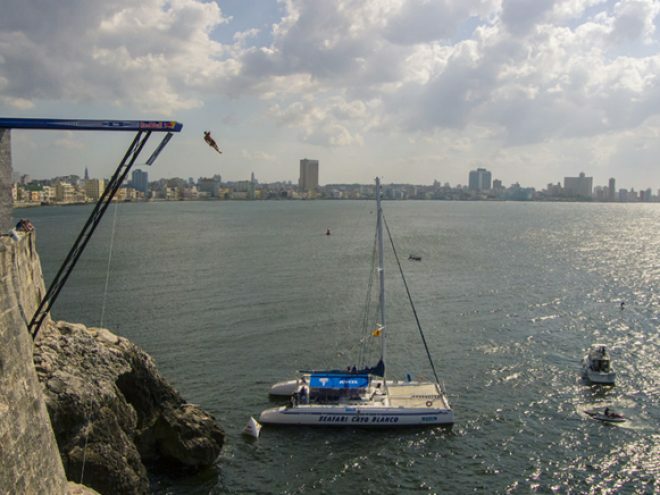 A light breeze, clear blue sky and a world class sporting event brought out los Habaneros by the thousands to watch these athletes launch themselves off the platform set 27 meters up from the mouth of Havana Bay. It projected out from the historic 425-year-old Morro Castle fortress (Castillo de los Tres Santos Reyes Magos del Morro), a perfect blend of the old with the new. Beautiful Havana provided a perfect backdrop as the divers hit the water at 85km per hour to appreciative oohs and ahs from the crowd watching at La Punta with a split eye to the big screen and the real thing. Entertainment was great as the DJs revved the crowd up between dive sets. The competition started on a Friday with the classifying dives that established seven duels for the grand finale on Saturday. First place went to the Russian Artem Silchenko who, with impressive finesse, showed he was the man to beat. Crowds started to fill up the area of La Punta by late Saturday afternoon and huge screens were erected to be able to watch the dives more clearly. At three o’clock, the final stage of the competition began. By 6:30pm, it all came down to the final two dives between Brit Blake Aldridge and the Mexican Jonathan Paredes. The crowd’s undoubted favorite at the end was Paredes who was leading until the final dive when he decided to play it safe allowing Aldridge to sneak past with a more technically difficult dive well executed. Easy is a relative word as anyone who had the good fortune to get up close to the platform would attest to! Another Brit, Gary Hunt, came in third while Colombia’s Orlando Duque (423.3) was fourth with little to separate these top four in terms of points. The event itself sees 10 of the world’s best cliff divers and up to four wildcards at each stop. Between May and October, the competition will continue in the US, Spain, Ireland, Norway and Portugal; until the final showdown in Brazil—another first for the athletes. * They enter the water feet first with their hands by their sides. * The second and third dives are performed in head-to-head format. * The final dive is made in reverse order according to their cumulative score from the first 3 dives. * There are a total of nine groups (front, back, reverse, inward, front twists, back twists, reverse twists, inward twists and all armstand dives). The two required dives must be performed from different take-off positions. There are 5 take-off positions (front, back, reverse, inward and armstand). * Each diver shall make two required dives with a fixed degree of difficulty and two optional dives assigned a degree of difficulty computed from the 2010 HDA table.Five judges score each dive based on a scale of 0 to 10 in half-point increments. The highest and the lowest judges’ scores will be discarded. The remaining three scores are added and multiplied by the degree of difficulty for that dive.